Homarus Americanus. Maine Lobsters, American Lobsters, New England Lobsters, whatever you want to call them, people like to eat them. And while they do come from other places from eastern Canada to North Carolina, it's the state of Maine that harvests the majority of lobster in the U.S. and is most closely associated with the lobster. They're so important to us as an industry, a food and a symbol that we even put 'em on our license plates! 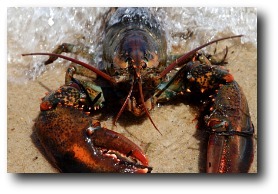 And each summer we celebrate our worthy crustacean at extravaganzas like the Maine Lobster Festival. There was a time that people most definitely didn't like to celebrate OR eat them, though, and often hid the shells so the neighbors didn't know they were eating “poor man's” food. Prisoners held at York's Old Gaol (circa 1719) were often fed lobsters, and the Native Americans in the area used the ground shells as fertilizer. Remember from your history books what colonial Americans used as a derogatory term for the English soldiers during the time of the Revolution? Lobsterbacks! It wasn't until the mid-1850's that tastes began to change, and new canning methods made it possible to ship lobsters from Maine farther than ever before. Today, Maine lobsters provide a livelihood for over 5,700 harvesters, and supports related businesses like processors, dealers, marine outfitters, boat makers, retailers and restaurants. Each trap, hand-hauled just like in the old days, is vital to the coastal towns that give Maine its unique character. York is no different – our coastline is beautiful, yes, but it's also a livelihood to many families here in town. Like this sign on Sewall's Bridge over the York river says, ours a “working waterfront”. Maine lobsters are generally harvested by boat captains working alone or with one or two other people. Boats usually stay within 10 miles from shore. Each individual can fish up to 800 traps, hauling and setting a portion of those each day. 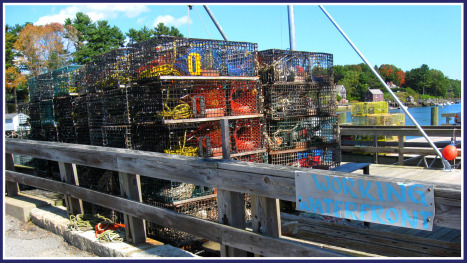 Click here for our "Interview with a York Lobsterman"! 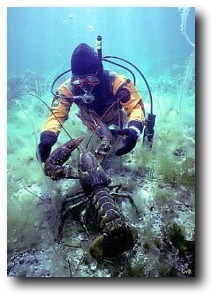 Many thanks to the Lobster Institute at the University of Maine for that photo! The colorful buoys that you see bobbing all around the coast of York are all completely unique, and each captain registers his or her buoy markings with the State. Lobsters are taken all year round in Maine, but most are caught between late June and December. The delectable “soft-shells” or “new-shells” are usually available July to October. There is less meat in a soft-shell, but the shells can often be cracked by hand and the meat is said to be sweeter. To learn more about our friend Homarus, there is a great Gulf of Maine exhibit at the New England Aquarium in Boston, which just happens to be an easy day trip from York! Looking for a great book to read while you're vacationing in Maine? Now doesn't that sound like a great read for a coastal Maine vacation?! When you're done reading and you want to go out lobstering while you're on holiday in York, FinestKind lobster boat cruises out of Perkins Cove in Ogunquit Maine will take you out and show you how it's done. 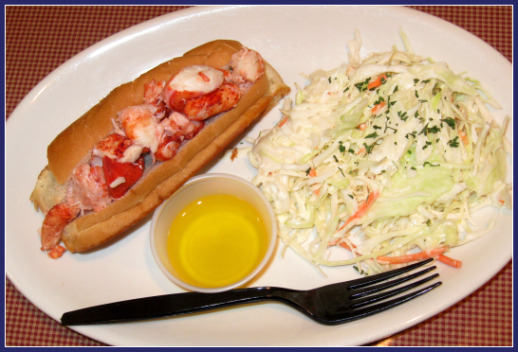 Enough with the talking, learning, and reading about Maine lobster – LET'S EAT! You can't throw a rock in York without either hitting a place that catches lobster, sells lobster or serves lobster. For pure and simple lobster, you can have it boiled or steamed with drawn butter or as a lobster roll. the lobster truffle purses appetizer at Frankie & Johnny's (more on Frankie & Johnny's on the Cape Neddick page of this site. Lobster truffle purses! I just like saying "lobster truffle purses", but eating them is much, much better. They're delicate little wontons stuffed with fresh Maine lobster, mascarpone cheese, and truffled butter, and baked until crisp. Yum! Fox's Lobster House - Nubble Point, York Beach, ME 03910. Phone: 1-207-363-2643. Cape Neddick Lobster Pound - Shore Road, Cape Neddick, ME 03902. Phone: 1-207-363-5471. Lobster Barn Seafood and Grill - 1000 Route 1, York, Maine 03909. Phone: 1-207-363-4721. Foster's Downeast Clambakes - Axholme Road, York Harbor, ME 03911. Phone: 1-207-363-3255. Lobster Cove - 756 York Street, York Harbor, Maine 03911. Phone: 1-207-361-1100. However, you'll find lobster in one delicious form or another on the menu of almost all our restaurants and southern Maine lobster pounds. I have to tell you something; I don't like cole slaw. If it shows up on a plate, I do my best to ignore it. But at the Shore Road Market they gave me a lot of cole slaw, so clearly the cook thought it was important for me to try it, no? That's the best darned cole slaw I ever had. I ate it all. Kenny Maine, who makes this slaw at the Shore Road market, told me he doesn't like cole slaw either and that's why he developed his “Kenny Maine's World Famous Cole Slaw”. Why isn't all cole slaw like this?? Sometimes you just want to grab a couple of Maine lobsters and either cook them at home or the camp site or have someone quickly cook them and pack them up for you. At Hannaford supermarket in York, you can pick up lobsters with your other groceries at the seafood department. They'll cook them there for you while you shop, too. Open daily. 5 Hannaford Drive, York, ME 03909. Phone: 1-207-363-5357. 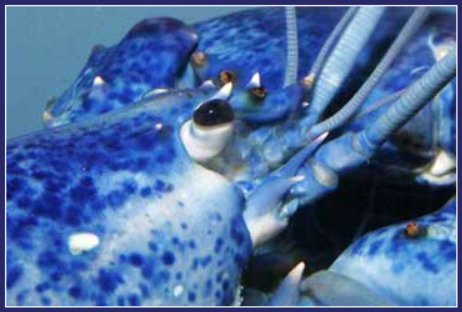 York Lobster & Seafood also has local Maine lobsters (and more) available year-round. 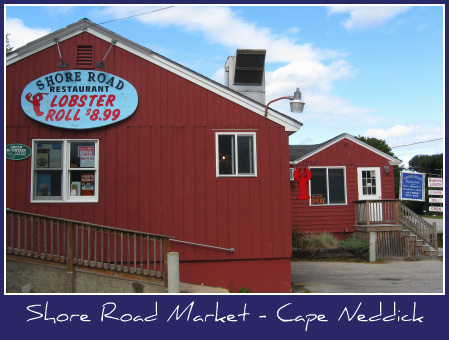 They'd be happy to cook them for you for a nominal charge, and you can even pick up an entire lobster dinner to eat in or take home: you'll get lobster, butter, cole slaw, corn on the cob, and a very impressed family! Address: 855 U.S. Route 1, York, ME 03909. Phone: 1-207-363-5000. At the Maine Lobster Outlet, you can pick up beer and wine with your fresh or cooked lobster, along with clam chowder, steamers, and lobster rolls. There's even a complete lobster bake dinner you can order (10 or more people, please). Open daily. 360 U.S. Route 1, York, ME 03909. Phone: 1-207-363-4449. Off The Boat Lobsters is a Donnell family enterprise. 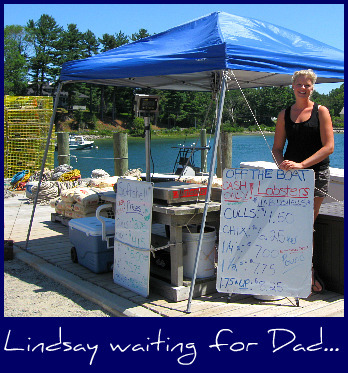 Dad Jeff, along with Uncle Bob and many other York lobstermen keep Jeff's daughter Lindsay (see picture below) stocked with fresh Maine lobster that come directly out of the water, off the boat and home with you - never stored in tanks. Call ahead for large orders. Open weekends April till "the weather gets bad", daily except Tuesdays from late May to early September. 2 Seabury Road, York, ME 03909. Phone: 1-207-337-8885. So what do you do with Maine lobsters when you get them home?? Especially if you didn't have them cooked first? My friend Christina the Lobster Queen from the great country of Canada can help you out with instructions on killing, cooking, preparing and eating her favorite food. In America, we've been frowning on having kings and queens for a while now, so I had to turn northward to find a genuine Lobster Queen. As the late, great Julia Child would say: Bon Appetit!